This was just delivered to my house. The fantastic find was really the guy before me. It came out of North Carolina and there's no sign of any humidity or water anywhere. There's almost no paint loss on the cabinet and very little on the castings. Probably one of the best all original surviving examples out there. The jackpot glass was broken into, but no damage to the castings and replacement wire impregnated glass is available. Missing the back door lock. The cash box looks brand new--it was missing the key, but I happened to have one (BAP4). There's were a few old nickels inside plus an OK Vender trade check. Between this machine and the Futurity a couple postings down, it's been a great summer for this slot collector! What a great couple of finds! Some funny detail on it for me and sure for Watlingboy . This machine ( only the case) must to be made at the begining( at the watling factory) for a Rol with gold award and front vender , but have lost them for be sold with a simple front casting . The gold award have been erazed on the award card ( it s an award card for gold award!) . And if you look on the left wood side , you have a bolt who don must to be here for a simple casting .But must to be use with the front vender casting only. If you can send me more photos ( via my Email /PM) with the serial number on the wood near the cashbox, the reel strip number and other info , you are welcome . Again , very very nice find . The original color and the good shape are very noce . Please , keep it like this and don t try to restore it . I bought the machine on eBay on July 11. 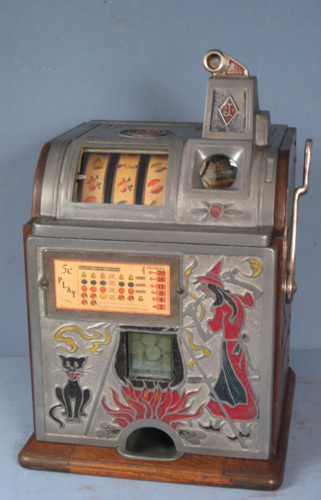 Here's the description: RARE Watling Rol a Top Rol-a-Top Five Cent Slot Machine All Original WORKS LOOK. That search with completed or sold listings still picks it up. It popped up just a minute or two before I saw it, I knew the "buy it now" price looked great at $2999, but it also listed the "or best offer". For those of you that aren't familiar with that feature, it allows the seller to review each "offer" or put in a bottom acceptable price, which, if an offer is above, it is automatically and immediately accepted. I was on it so quickly, I thought I would try an offer, then just do the "buy it now" if I didn't hit the automatic accept range. So I put in $2750 and it was in the range and the deal was done. I think it was up less than 5 minutes and sold. Then I had to figure out transport because it was local pickup only. I paid via PayPal, then contacted the seller, who said he would help or hold the machine as long as I needed. I contacted a guy that hauls machines around the country and he thought he would be passing though there the next day. That fell through, so I waited a couple weeks to see if he would be back through the area. My fallback was one of the specialized transport companies--STI or Beltmann--they charge about $500 and it doesn't matter if it's a slot machine, pinball or jukebox, pretty much $500 for anything that fits on a pallet. Turns out the guy, Milton Sawyer (a super nice guy) ran a store called "The Treasure Hunter" in Elizabeth City, NC, buying estates and gold and silver, etc. He said a young man inherited this machine and brought it in the store and sold it to him. Milton said it was one of the prettiest items that ever came through the door. A couple weeks after the hauler fell through, I decided to go the expensive route and use Beltmann/STI and get the machine moving my direction. I was communicating with Milton to coordinate pickup and then the communication went silent. After a couple days, I emailed through eBay and I received a reply from Milton's wife, Angel Sawyer. "We were robbed and my husband is no longer with us" along with a link to the story: https://www.wfmynews2.com/article/news/ ... -580694763. Angel agreed to help me coordinate pickup while planning the funeral of her husband, but the communications were erratic. I thought it was understandable given the situation, but I was nervous about getting the machine. STI tried to catch her several times without success. I emailed through eBay and it was agreed for pickup last Tuesday August 14 with delivery to me August 21 and that worked out. Last night I googled to see if there was any update on the case and this popped up: https://www.wnct.com/news/local-news/wi ... 1387927424. I am glad you got the machine, it does look very nice and you got a great deal on it. I cant believe that guys wife killed her husband or was involved. Holy sheet ! Great story great machine great find ! Better grab yourself a couple lottery tickets , man were you ever lucky !